I love tools and I'm not joking when I say that tools are one of the main reasons I went in to the metal working field, so I thought I would make a list of my favorite tools. Not necessarily the ones I use every day, but the ones that I really like. I'm also working on a list of my least favorite tools. After the first two items on the list the rest of the list is in no particular order. 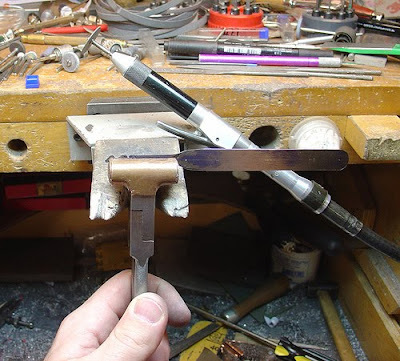 10x loupe - I am starting the list with the 10x loupe, because it is one of two tools I own that is always out on my bench. My tools are usually scattered all over my bench, but when I clean everything gets put away, except for my loupe and caliper, they stay out because there's no reason to ever put them away. Everything has its place and the place for my loupe is on my bench top right in front of me. I am always inspecting everything with a 10x loupe while I am working and when I am finished. There is so much more to see when you are looking at things under magnification. Mitutoyo digital caliper - This is the other tool I own that is always out on my bench. I am constantly using calipers. I used a cheap vernier caliper for about 4 1/2 years, then I got a cheap digital caliper. It was ok, but I always had to close it and make sure it was zeroed before using it. In 2006 I got my current 6" Mitutoyo digital caliper. It's much better. It never needs to be zeroed, when you close it it always returns to 0.00. It's also sealed against dust and moisture to a certain degree. I'm sure other quality brands make good calipers too, like Starrett, but I haven't used them. Ultrasonic - There was a period when I didn't have one, and that period sucked. After polishing all the little 3mm pieces of tubing on my teapot I had to clean all 109 of them by hand with a toothbrush because I didn't have an ultrasonic. The ultrasonic is also the best way to clean a piece of aluminum before anodizing. For some reason they aren't really into the ultrasonic at universities I have been at, and the art center I taught at. I have no idea why. When I worked as a bench jeweler the first thing I would do in the morning was turn on the heat on the ultrasonic, and turn on the steam cleaner. At these schools and the art center the heat is never turned on, usually it needs water added, and I rarely saw anyone using it. I am ashamed to show this photo of my Chinese made ultrasonic, I needed one but I couldn't afford an American or German one. NSK E-max micromotor with belt sander - This sander is the reason I bought the E-max micromotor. It saves me so much time making my aluminum pieces and shaping the wood handles of my lock picks. When I say it saves time, I mean it saves so much time that if I no longer had this tool I would probably quit working in aluminum. This isn't something I use to put a final finish on a piece, but it is perfect to use after filing or grinding with a bur, which is how I shape all my aluminum pieces. Hand finishing can come after that. Belts come in 4, 6 or 8mm widths, mostly I am using 4 or 8 mm in 120, 240, or occasionally 400 grit. Belts are available between 80 and 800 grit, they also have diamond belts up to 1000 grit, and felt belts. They are kind of hard to find though, the only place I have found them is here. The E-max is adjustable from 1000 RPMs to 35,000 RPMs (someone else can figure out what that is in SFPM, I really don't care), so you can turn it up when you want to remove material quickly, or turn it way down for sanding around details. The problem with this stuff is the price. I have bad news for anyone who may be now thinking they want to buy one of these belt sanders... they are around $400 just for the sander, and you still need the $800 E-max. To my knowledge Rio Grande never had these sanders in their printed catalog, but in 2007 they had them on their website in the close out section for $150, thats when I bought mine. A year later Rio still had them in the close out section, now for $50. By that time this tool was so essential to me I bought a second one as a back up. They no longer have them anymore. Super glue - Not just any super glue, it has to be the one in this awesome "Frustration Free Applicator" made by Loctite. There's just a little tube or something inside the plastic and you squeeze the sides to use it. I won't buy any other super glue. Seriously. I only use super glue while I am making things, it doesn't get used on any finished pieces. I use it for things like making sure I am happy with the position of a part before soldering it on. Like in the photo below, that square thing on the right end of my teapot is glued on. If I am happy with it where it is I will mark it with a scribe. 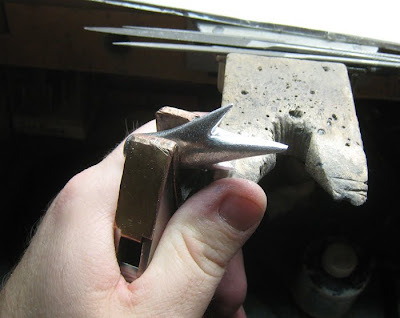 I also use it when making lock picks to to glue my handle templates to the steel to trace. I have used it to hold parts I am milling and to hold parts I am cutting on the lathe. Bergeon locking parallel pliers - The pliers in the photo below are Swiss, there's also a German version which are black, and a much cheaper version that are probably made in China or Pakistan. Otto Frei sells the German version, Progress Tool apparently sells all three versions, but they show the same picture of the Bergeon pliers for both the Swiss and German versions. I wonder if they have them all in stock? Rio no longer sells any of these pliers. They work best for holding things with parallel sides, like this piece of aluminum that went on the lid of my teapot. They also work for some things that have somewhat parallel sides like this piece I have been working on recently in the photo below. The pliers in the photo below - I don't know what exactly they are called. 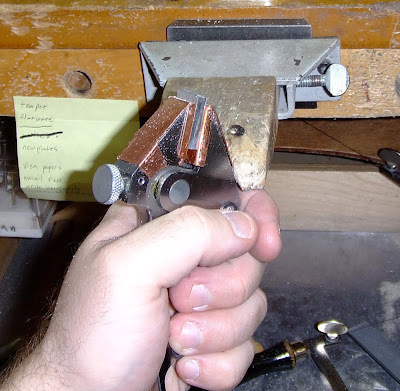 Otto Frei calls them "sliding hand vise pliers," Progress tool calls them "chipping tong pliers," what ever that means. What ever they are called I like them. Mine are Italian made, from Progress tool. Otto Frei used to sell German ones, now they only sell Pakistani ones. I use these for holding small pieces of sheet metal to file or saw. They are especially useful for making my lock picks. With these pliers and the parallel pliers you need to put the piece you will be filing as far into the pliers as possible so it can't bend or vibrate as you file. When I am filing my lock picks I usually have the metal sticking up past the top of the pliers only about 1mm. In the photo below I am using a separating disk to cut some of the notches in the left end of the pick. Miter vise - Tool catalogs often say this tool is good for holding things for sawing. I never found it very useful for that. 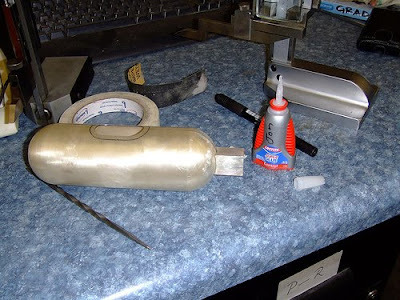 For me its only purpose is to old something to file something completely flat, like the ends of a piece of tubing or rod. Foredom #18 quick change hand piece - For me, this quick change handpiece is better than any others I have used because you are able to push the lever to release the bur with the hand you are using to hold the handpiece without changing your grip. Changing a bur takes about 1-2 seconds. There are a lot more tools I love, but this list is good enough for now. Maybe I will write another post someday and continue this list.